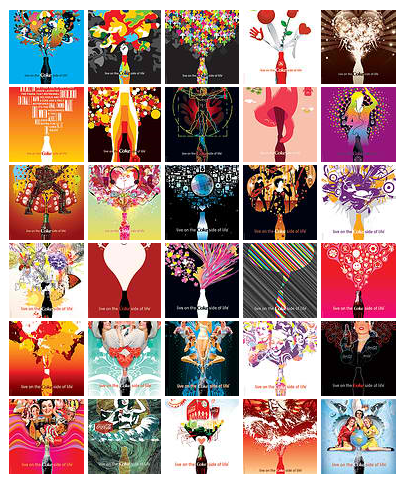 Again, in my never ending search for graphic ideas I found the official Flickr account of the Coca-Cola Art Gallery. It displays different interpretations of "The Coke Side of Life" philosophy done by leading artist and designers. Click on the image below to get to the photostream and see the detail of each entry. There are 163 artworks in the photostream. I've never seen so many illustration styles and techniques in one flickr account. Browsing through their pages is like drinking a big bottle of real good ideas. Advertising indeed has played a vital role in shaping Coca-Cola into a timeless brand, and conversely, Coke has continually challenged artist and ad agencies to create innovative images - making them a "catalyst for creative expressions, right ideas at the right time". I'll drink a Coke to that! Coffee: Drink It, Paint with It.